Are you sick of hearing about Skellig Michael on my blog yet? Yes? Well, too bad! My mom made another of her amazing cakes for my birthday. It was a “traditional” Funfetti cake that she decorated to look like Skellig Michael, where the ending scene of The Force Awakens was filmed and which I visited last summer in a very memorable experience. She used some small Bundt molds to make the mounds for Skellig Michael (on the right with the puffins and steps) and Little Skellig (on the left with the seals). Can’t you just see Rey walking up those steps? The puffins were hand-made out of marzipan, so they were tasty as well as adorable. The cake itself was delicious, though the icing made our mouths turn blue. I ate some of Skellig Michael with a puffin. The lettering says “Breithlá Sona” which is apparently an Irish translation of “Happy Birthday” (at least according to Google 😉 ). My mom made another awesome cake, this time for my sister’s birthday. 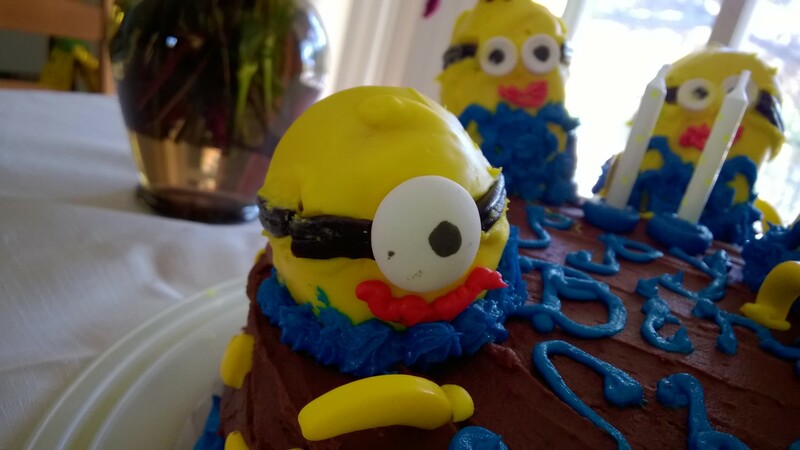 A chocolate cake with Minions on top! 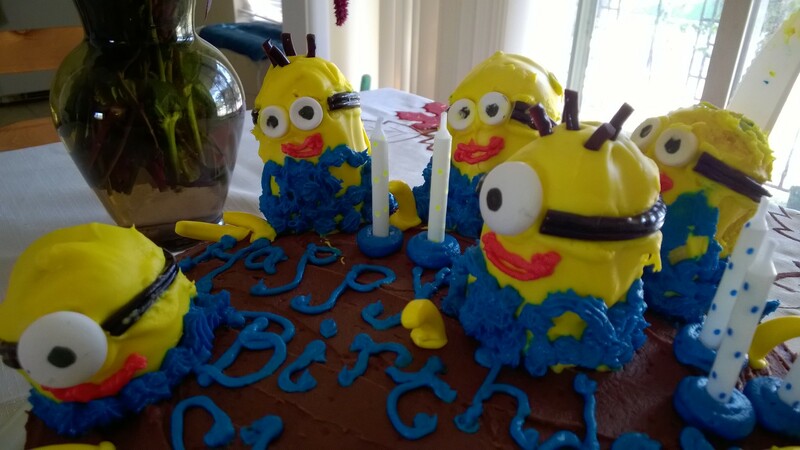 The Minions are made from iced Twinkies, with licorice, Smarties and Mentos as decoration. Also banana Runts. The cake was delicious and the blue icing turned my mouth blue. Good times all around. 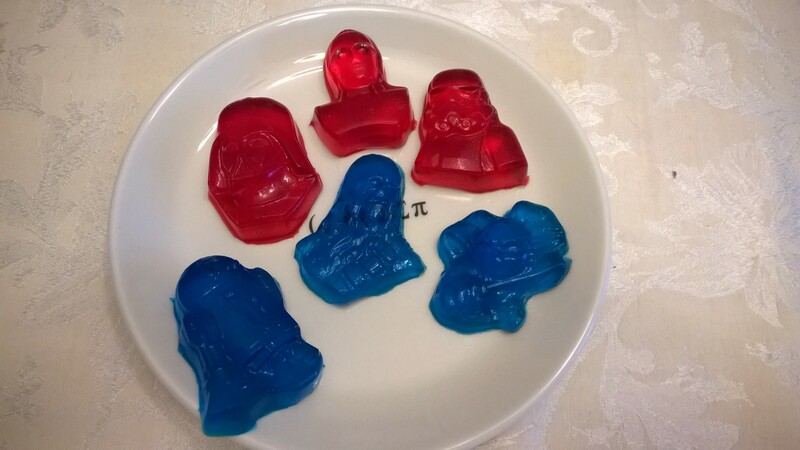 So, yeah, we totally had Star Wars Jell-O today. They actually came out really well by just following the directions on the box. 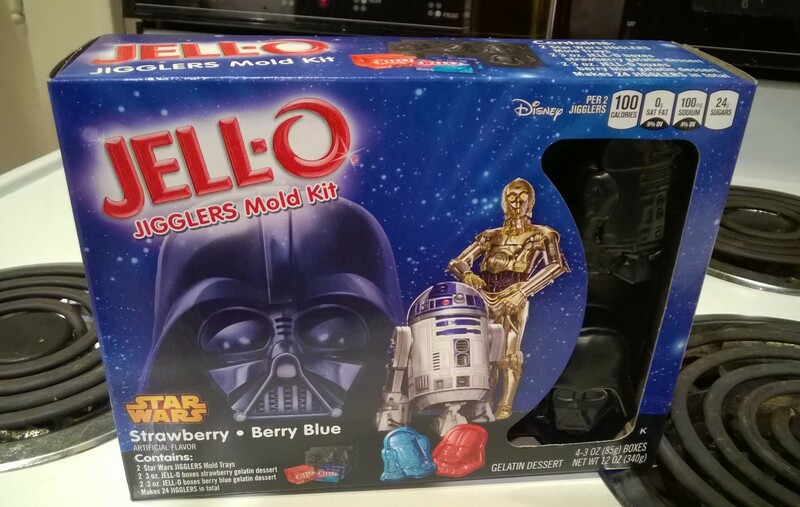 You can make 12 shapes at a time, and the box has enough Jell-O to make 24 total. I am generally not a fan of commercialized holidays; my husband knows better than to buy me anything for Sweetest Day, for example. But I actually love Valentine’s Day. I celebrate it in a rather Japanese fashion: in Japan, women give chocolates not only to their boyfriends/husbands/boys they like, but also to their girlfriends and coworkers (the ones given to coworkers are hilariously called “obligation chocolates“–it’s very Japanese). I love to do things like bring in cookies to work, or hand out silly kids’ Valentines, and make my husband something tasty. And for his part, B never gets me candy on Valentine’s Day, because it tastes exactly the same several days later, when it is 3x cheaper. This year I made him a frozen peanut butter pie. This is one of the famous desserts at Ray’s Place in Kent. My husband went to Kent State, and still meets some of his college buddies at Ray’s frequently. I used this recipe, but substituted a pre-made Oreo crust with a layer of chocolate sauce between the crust and filling. This is a pretty quick and easy pie; it’s no-bake! Unfortunately, I put in in the freezer on Valentine’s Day when we started to make dinner, and then we forgot about it until Monday. Too much champagne, I guess. 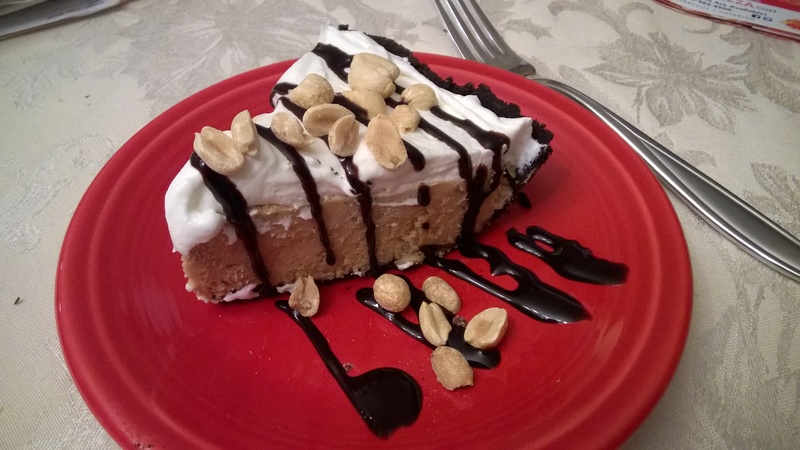 The last time I made this for B, I presented him with a slice, and he informed me that at Ray’s Place, they put chocolate sauce and peanuts on top. Well, then. Did I get it right this time, dear? To continue our unique Valentine’s Day, we also went to see Kingsman: The Secret Service over the weekend and really enjoyed it. If you’ve ever wanted to see graphic violence be described as “beautiful,” this movie is for you. I did give a bit of an eyeroll at the end, where I think they took a joke a bit too far. But otherwise it was quite good, and I’d highly recommend it.